If I had to describe this episode in a word I would have to call it tedious. I struggled to keep my eyes open as I watched. Shadowhunters: The Mortal Instruments might just be why coffee was invented. It's episode two and the acting certainly hasn't gotten any better - particularly that of Dominic Sherwood. That has to be some of the worst casting I have seen in a really long time. So Simon comes chasing after Clary and naturally he wants to go to the cops but Clary is by now certain that this isn't something that the cops can help with and encourages Jace to reveal himself. They enter the institute and Simon is instantly amazed with the technology. It's time to figure out what's going on with the Circle and the Mortal Cup. Clary makes it clear that while she and Simon are a package deal, they are not boyfriend and girlfriend. As much as Simon wants to be there for Clary, the chance to spend some time with Izzy is too much to pass up. Teenage hormones win the day I suppose. Jace and Clary head off to see Hodge, who is not an old man the way he is in the books, but is in fact a weapons trainer. I'll admit Hodge is cute but abs don't make an actor, thus affirming in my mind that these actors were cast for the looks and certainly not for their talent. Hodge has a rune on his neck which causes him pain each time he speaks about Valentine or the Circle but he powers through it because Jace and Clary need to know what's going on damn it. Hodge wonders what would happen should Valentine get his hands on the Mortal Cup even as he keeps repeatedly saying that Valentine is dead and the circle has been disbanded. Cup is so super special that it can either be used to create more Shadowhunters or control demons. 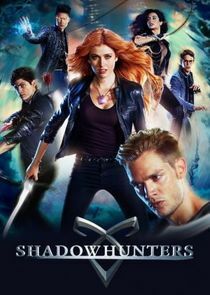 Clary is determined to go after the cup because it's the only link to her mother; however, Jace is quick to point out that Clary is untrained and in over her head. But damn it all, Jace loves Clary's never say die attitude and he's in for the fight. I guess this is what happens when one teen rebel recognizes another. It's okay to give up now and roll your eyes. So it's time to figure out who the warlock is who wiped Clary's memories and that brings us to Dot but one cannot go warlock hunting without ensuring that one has their Zoolander look in place and to that end, Izzy lends Clary some clothing. This of course allows some time for girl talk and Izzy is happy to let Clary know that it's totes okay to crush all over Jace because she sees Jace like a brother. Now it's time for Clary to use the force, umm I meant embrace her inner Shadowhunter because according to Jace she was born to do this. Dot has been keeping busy. She finds Maguns Bane to report that not only has Jocelyn been kidnapped, but poor Clary is unaccounted for. Magnus however is more interested in protecting his own hide since Valentine has declared it Warlock hunting season. Dot however is loyal and refuses to lam it with Magnus but when she heads outside, it's clear that she is being watched by someone in the Circle. I think it's time people stop believing that the members of the Circle are dead because they keep showing up everywhere. So as you may have guessed, the plan to get to Dot failed and now Clary is upset. Nice to know that she can stay on task for a few minutes in between ogling Jace. Jace brings up the Silent Brothers and Izzy and Alec are not at all cool with this. The siblings are concerned what this could do to Clary (since when is Alec really concerned about Clary's welfare?) Clary however is full steam ahead once again earning her points in Jace's eyes. So they arrive at the bat cave (read the Silent Brother Enclave) and twice in on day, Alec expresses concern for Clary but Jace explains that Clary has lost everything and he knows what that's like. They totes relate to each other folks. Now that Alec sees the similarity he is totally sensitive and agrees to guard the perimeter. Simon who is still in the thrall of Izzy, agrees to stay and watch the gate. Once again, hot girl wins out over BFF loyalty. Is it me or did he seem to get over Clary awfully fast? Jace and Clary head into the City of Bones and he warns her that she could die if she's not strong enough. Here comes the big pay off people. The ultimate moment of aww. Jace and Clary hold hands. Squee! Go ahead and squee hard because you know you want to. Clary gets into a circle, a sword is lowered and Clary starts to get some of her memories back. So yeah, Clary's a Shadowhunter and her father is none other than Valentine. Speaking of Valentine, Dot has managed to escape and even takes out a few of his warriors. Dot makes her way to Jocelyn to assure her that Clary is going to be okay. Yeah, since she's the protagonist, I could have told you that. Unfortunately for Dot, the bell is tolling for her and Valentine takes her out with a seraph blade. Just like that we have a POC sacrificing themselves for the greater good of Whiteness. That didn't take long did it. Simon is making the most of his time with Izzy and gets his flirt on. Can you saw awkward? They talk about Simon's band but Simon doesn't have phone so she cannot listen to his music. It all comes to an end when Izzy hears a sound. Izzy orders Simon to get in the van and lock the doors and he complies. Unfortunately for Simon, the noise Izzy heard came from inside the van. Izzy tells the rest of the scooby group that Simon was taken. The group start to formulate a plan to get Simon back from the Downworlds, when they notice a young woman dangling Simon by his foot from a bridge. It seems that in exchange for Simon, the vampires want the Mortal Cup. It's only episode two and already I cannot stand this show. I am sick of the actors constantly taking the time to pose like they are on a photo shoot. The bad acting makes it difficult to watch and the lines that these actors are given to speak make it even worse. I cannot believe that there are eleven more episodes to go.